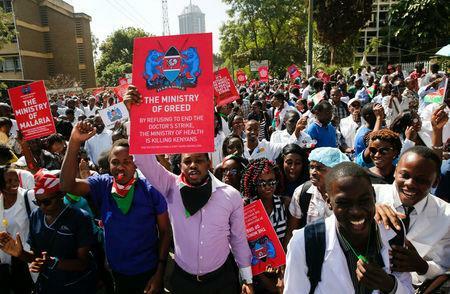 NAIROBI (Reuters) - A Kenyan judge ordered on Monday that officials from the national doctors' union be sent to jail amid a strike at public hospitals that has turned into a test of President Uhuru Kenyatta's leadership before August elections. As news of the ruling emerged, riot police took up positions and doctors wearing white gowns and surgical caps blew whistles and chanted angrily in the street. The opposition condemned the court's decision as an "extremely dangerous precedent." A series of corruption scandals, including an investigation into millions of dollars allegedly missing from the Health Ministry, has bolstered support for the doctors, even as Kenyan media have reported that patients have died during the strike. A court declared the strike illegal in December. In January, Justice Hellen Wasilwa sentenced leaders to jail for ignoring her earlier ruling, but suspended the sentence to allow time for talks. On Monday, she ordered union officials arrested. "This court decides to resume its order sentencing the applicants to a one-month jail term," she said. The union, which has about 5,000 members, wants the government to implement a deal agreed in 2013 to give doctors a 150 to 180 percent pay rise on basic salaries, review working conditions, job structures and criteria for promotions and address under-staffing in state hospitals. The government has said it can only afford a 40 percent pay rise. "It’s a painful experience that the country is going through ... a return-to-work formula by last night had not been reached, leading to the events of today," Health Cabinet Secretary Cleopa Mailu told a news conference later on Monday. "We have been trying to get a solution to this problem ... We were committed the eventuality of today doesn’t happen and ... services to resumes in our hospitals, but that has not happened, as we see it today," he said. The Kenya Medical Practitioners Pharmacists and Dentists' Union had warned that doctors in private hospitals might also strike if union officials were jailed. Union leaders were not available for comment. "Rather than resolve the crisis in the health sector, the jailing of union officials deepens it and sets an extremely dangerous precedent," said opposition leader Raila Odinga. "We are horrified, disturbed and shocked," he said in a statement. University lecturers are also striking over pay, worsening the political crisis before elections in August, when Kenyans choose their next president, members of parliament and local governors.